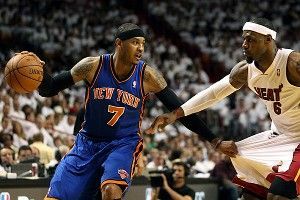 » How Can the Knicks Counter Miami’s Fronting? How Can the Knicks Counter Miami’s Fronting? The adjustments a coach makes between games (and during them) in a playoff series can decide whether his team makes a run to the Conference Finals or bows out in the first round. The New York Knicks didn’t make enough in-game adjustments against the Miami Heat on Saturday, especially when it came to how Miami defended Carmelo Anthony. Despite missing his first seven shots, Anthony was playing well — he was moving well and making the right passes to cutting teammates for spot-up jumpers and other scoring opportunities. In terms of my personal basketball philosophy, I prefer sets over isolation plays. But I’m willing to concede that the action in this video is effective isolation. Why? Because there is action both before and after Anthony gets the ball. He uses a cross screen, catches the ball on the block, waits for a cutter to draw the defense into the lane, makes a move, and then passes out for an open 3-point shot. So even though Anthony was struggling with his shot, he was affecting the game and creating offense for his teammates. Then something happened. Miami started fronting Anthony midway through the second quarter. This Heat used this strategy on a few possessions late in their last regular-season game against the Knicks, but they denied Anthony the ball much harder in Game 1. In the regular season, Miami fronted Anthony to force him off the block. Once he decamped to the perimeter, they let him catch the ball. On Saturday, the Heat committed to a full front on Anthony all the way out past the 3-point line. It was as if they were daring the Knicks’ ball handlers to lob the ball over the top. Once they started fronting Anthony, that’s when the Heat started pulling away. When Miami started fronting Anthony, the Knicks lost all that effective movement they had when he was getting the ball. This is because the Knicks don’t have many good passers. Without Jeremy Lin, the Knicks’ best passer might be Anthony, who obviously can’t lob the ball to himself over Miami’s front defense. Once Miami takes away the pass to Anthony, it forces guys like Baron Davis and J.R. Smith to create off the dribble. Credit Erik Spoelstra and the Heat for recognizing this and devising a way to keep the ball out of Anthony’s hands and drive the rest of the Knicks into panic mode. It’s understandable that the Knicks struggled with this tactic, since the Heat sprang it on them in the middle of the game. Once the Knicks got into the locker room for halftime, however, the onus was on them to make adjustments. Only that didn’t happen. Before the second half started, the broadcast team reported that Mike Woodson said adjustments weren’t needed and that the Knicks were just going to go out and play their game. I suspected Woodson might just be hiding his strategy, but he was telling the truth. The Knicks didn’t appear to make any adjustments in the second half. The beginning of the third quarter looked the same as the end of the second. The Knicks let Anthony try to outmuscle the defender fronting him, while the New York guards tried to lob him the ball. The results: one turnover and one offensive foul on Anthony. This defense was extremely effective in Game 1. Since the Big Three came to Miami, Spoelstra has tended to stick with a strategy until it stops working (the way Miami hedges hard on ball screens, for example), so the Knicks should expect to see this again. So what adjustments can New York make to counter this defense? First, they should get Carmelo Anthony out by the 3-point line, clear out behind him, and lob him the ball over the top. When he gets it, the other Knicks need to move without the ball. This is the first possession that Miami fronted in Game 1, and this might have been the Knicks’ best possession against it. The key is getting a good pass. It’s easier to throw the lob when there’s more space behind Anthony and the man fronting him. Here, Melo is being fronted on the wing. Smith tosses the lob — it’s an ugly one, but it gets there — and Chris Bosh leaves to double Anthony. Landry Fields cuts on the pass and Anthony finds him for a dunk. What else can the Knicks do? They can use movement to help Anthony get open. 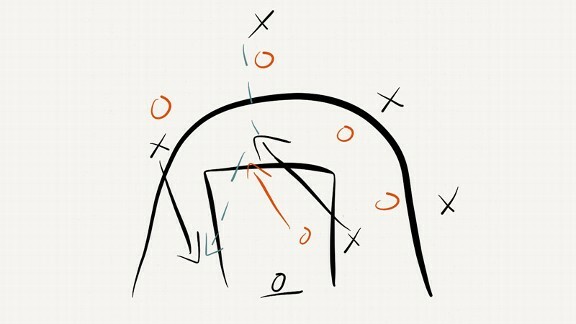 For example, they can initiate the offense by having him set a back screen. Here, the play starts with LeBron James covering Carmelo Anthony. Smith swings the ball to the other side of the court and then Anthony sets a back screen for him. This forces the Heat to switch, with Dwyane Wade picking up Anthony. Wade isn’t as strong as James, and this allows Anthony to work around the front and get to the elbow, where he’s a particularly dangerous offensive threat. Anthony doesn’t score on this possession, but I like his chances when he catches the ball in this spot. Other adjustments can be made. There are sets and options the Knicks can use to take advantage of the Heat’s fronting defense. I drew up a couple on my iPad, using Paper, while watching the game. The first involves flashing a big man to the middle. Here, Anthony is on the left wing and his defender is fronting him. The Knicks send a big man to the middle and pass to him. 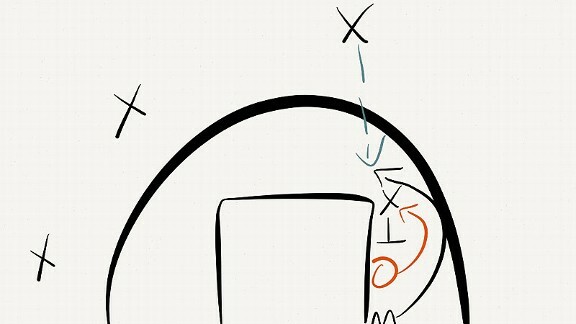 Once the ball goes to the middle, Anthony now has inside position, with his man sealed on the wrong side of the basket. With the ball in the high post, Anthony can hold James or Shane Battier off and then he’s just a bounce pass away from an easy layup. The second option is to set a pin-down screen for Anthony. This is similar to the back screen. By setting a pin-down for Anthony, the Knicks force the defense to make a decision: Either Anthony’s man must trail him and give up his position in front of Anthony, or the Miami defenders will switch on him to maintain the front. If a smaller player switches onto Anthony, it can be much easier for him to get the ball, even if he’s being fronted. The most important thing the Knicks must do between Games 1 and 2 of this playoff series is figure out a way to get Anthony the ball. If they don’t, we’ll see more of Anthony struggling to get the ball while his teammates panic and try to create offense on their own, and they’ll be heading back to New York down two games to none. Can the Nats Keep Up This Pace?